Appliance Warehouse of America, Inc., provides washing machine and dryer rentals to individuals living in apartment communities, condominiums, and single-family homes. With locations across the country, Appliance Warehouse of America is available to serve all of your laundry needs. Appliance Warehouse of America has full size washing machines and dryers and 24" stackable sets available and we anticipate that with the growing availability of front load washing machines we will add additional products in the future. With our state of the art technology you will get outstanding service and fast delivery of the equipment you want. Quick and convenient leasing, purchasing and service are just some of the ways we provide value to our customers. Appliance Warehouse of America is dedicated to giving you the highest quality products and services, which is why we are Whirlpool brand's largest washing machine and dryer leasing trade partner. 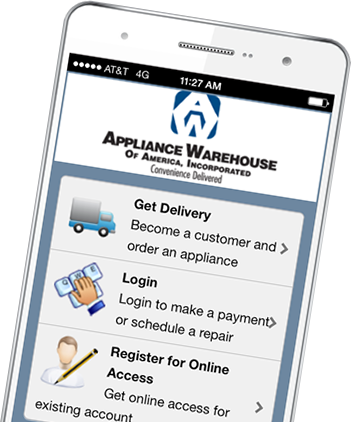 We know you want choices, so with Appliance Warehouse of America you always get "Loads of Options".